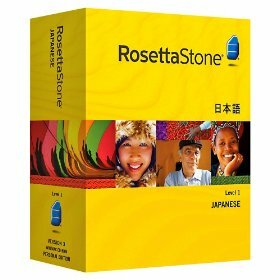 I have Rosetta Stone Japanese; it was given to me as a gift. I have to say, I'd discourage anyone interested in purchasing it. It's expensive, and I personally don't use much of what I "learned". I LOVE languages; I'd like to think I'm decent at learning and remembering phrases in different languages. I take Spanish as a formal class in high school, so I know the bases that need to be covered in order to remember what I've learned. For anyone, in any language. It's important to have reading, writing, listening and grammar/syntax rules as part of your curriculum. Unfortunately, I found Rosetta Stone to be lacking in grammar/syntax rules (which drives me nuts) and in reading. True, the program spells out what you're saying. But it's SO easy to just infer the meaning from context and know full well what it means. That's not always a good thing. It means that when presented a word you don't know, you won't be able to correctly identify a contextual definition should you stumble across one somewhere. And it's guaranteed you will. I still do in English, and that's my first language! It's a valuable skill to have, and I was disappointed to find it wasn't utilized in Rosetta Stone's program. The other thing I found seriously lacking was rules. I love to know what I'm literally saying, how it's translated, and what rules are in effect. For example, the phrase "Me gusta dibujar." in Spanish is translated as "I like to draw." But the literal translation is "Drawing is pleasing to me." There are a few rules in effect, such as only one conjugated verb in a sentence, etc. But Rosetta Stone only offers you the translation. Not WHY the words are in a sentence, or HOW to build your own, just the sentence. Not even a sentence diagram ((labeling the verb, adjectives, adverbs, etc.)) is offered. Nothing. That drives me insane. It seems to me there are better, more fun programs to learn a language with. My brother just got me one for Christmas 2009, called Japanese v3.0, by Instant Immersion. He purchased it at Half-Priced Books, and it's a lot of fun. I've retained most of the information I've learned with this program. I thoroughly enjoy it. Another program I suggest is called Learn In Your Car. That one builds a solid foundation with easy and common words. That one was also interesting, although a little too straight forward for my taste.